Islam is one of the most important religions in the World. Indeed, more than one billion people identify themselves with Islam. That means that about one out of every five people in the world is a Muslim (follower of Islam)! The majority of Muslims live in western, southern and south-east Asia. Next to Asia, Africa is home to the next largest group of Muslims. Indeed, some experts estimate that almost half of Africa’s population identify themselves as Muslims. More recently, Islam has spread into West Europe and North America. In fact, Islam is the fastest growing religion in France and Germany! 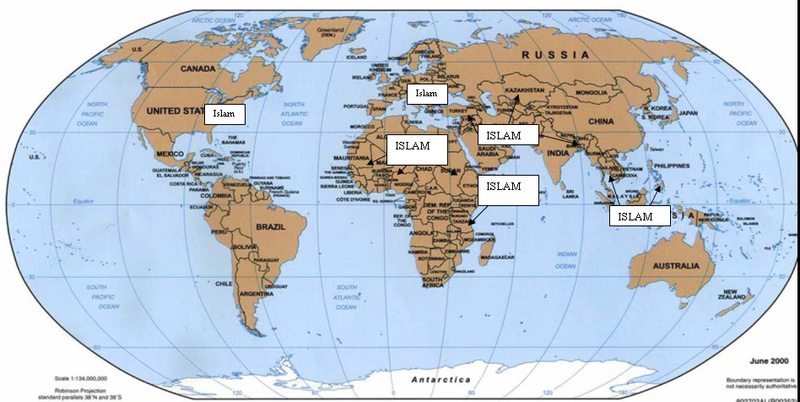 Click here to see a World Map of Islam. 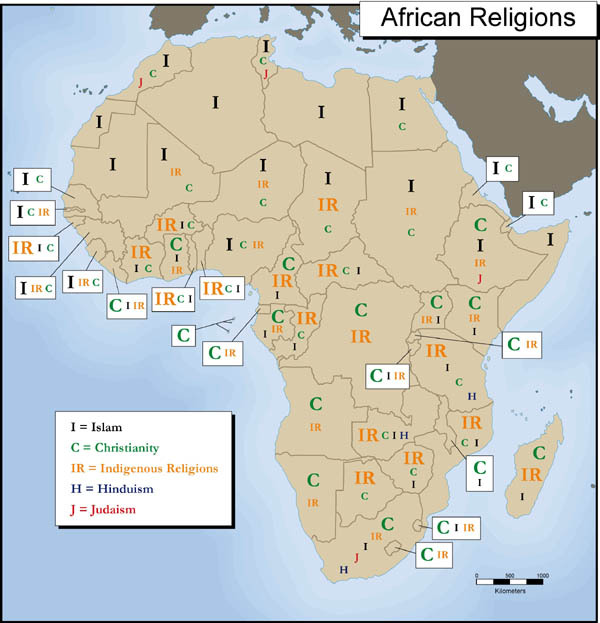 Also, take a minute to review the map of African religions by clicking here. Islam was founded in what is today the country of Saudi Arabia in 610 C.E. According to Islamic tradition, Gabriel, an angel sent by Allah (God), appeared to the Prophet Muhammad. Through many revelations, Gabriel revealed to Muhammad what Islam teaches is the last of Allah’s revelations to human-beings. The collection of these revelations are written in the Quran (sometimes spelled Koran), the holy book of Islam. Islam teaches that throughout human history, Allah was revealed through important prophets. The first great prophet was Adam -held by Christians and Jews, as well as Muslims -to be the first human-being created by God. Abraham, Moses, Elijah, and Jesus are also considered by Islam to be important prophets. However, while Muslims hold these prophets in highest esteem, they believe that Allah chose Muhammad to be the last and greatest of God’s prophets. As such, God’s revelations and guidelines contained in the Quran are God’s final direct words to human-kind. In Arabic, the language of Muhammad, Islam means to Surrender or to Submit to the will of Allah. Muslims are people who chose to submit themselves to the will and guidelines of Allah. Like all major religions, Islam has a rich and detailed theology, or system of beliefs. You are encouraged to further investigate Islam and its teachings and contributions to world culture and civilization. You may want to visit the website below. While Islam has a rich and complex theology, five major teachings, or pillars, provide the central tenants of the Islamic faith. 1. The Basic creed of Islam states “There is no God but Allah, and Mohammad is the prophet of Allah.” This is a central belief of monotheistic religions -there is only one supreme God. 2. Importance of Prayer. Prayer is central to the lives of Muslims. Muslims are called upon to practice two types of prayer. One type of prayer is personal prayers of devotion or special request. These prayers can be made at any time, and they are not governed by special rituals or formulas. The second type of prayer is ritual prayer, done as a communal activity, with specific words and kneeling in the direction of the holy city of Mecca. These prayers are offered five times a day: at sunrise, midday, mid-afternoon, sunset, and before going to bed. At each Mosque (holy meeting place), the imam, the prayer leader, calls the congregation to prayer. There are no chairs in a Mosque, worshipers kneel through the prayer service. Before participating in any of the five daily prayers, Muslims ceremonially wash their face, hands, and feet, cleansing themselves before approaching God. Friday is the special day of worship for Muslims. On Fridays, Muslims are supposed to attend prayers at their local Mosque. In addition to the daily prayers, the Friday service includes readings from the Quran and a sermon. 3. Pilgrimage/Hajj. In 622 CE, the prophet Mohammed was forced by his enemies to flee for his life from the holy city of Mecca to a nearby city of Medina. This pilgrimage was a central event in the life of the prophet. Consequently, the Quran strongly encourages all Muslims to participate in an annual re-enactment of the Pilgrimage. In recent years, over a million Muslims from every continent participate in the annual pilgrimage. Individuals who are fortunate to complete the pilgrimage are allowed to add the honorific title Hajj to the front of their name. 4. Fasting. The Quran teaches the importance of fasting. Fasting, it is thought, helps people to focus on God by taking their minds off material needs, the most important of which is food. So important is fasting to the Islamic religion that one month each year, the month of Ramadan, is set aside for fasting. During Ramadan, Muslims do not eat of drink anything from sunrise to sunset. Small children, pregnant women, and people who are ill are not expected to practice the fast. 5. Zakat. Islam teaches that Muslims are responsible for the well-being of all people. To assist people who are less fortunate, Islam strongly encourages Muslims to share with the less fortunate. This obligatory contribution is called the Zakat. As in most major religions such as Christianity, Hinduism, and Judaism, Islam is divided into groups, or what Christians call denominations. The largest group of Islam is the Sunnah (“well-trodden path”) and the next largest group is the Shi’ah. The vast majority of Muslims in Africa are Sunni (followers of Sunnah). 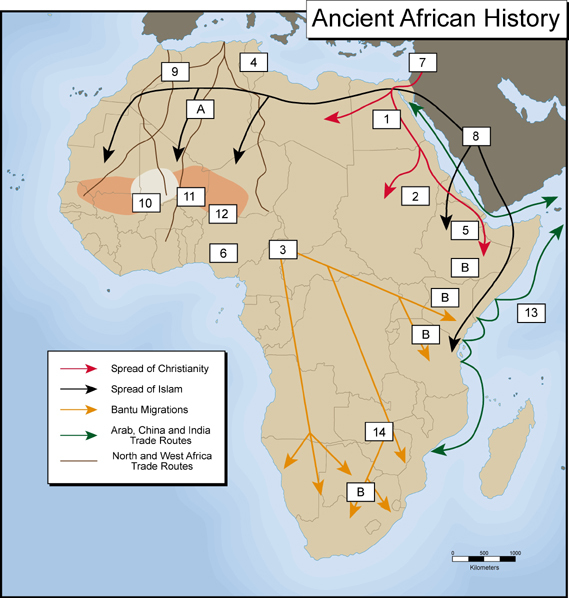 Look at the map Spread of Islam in Africa. Notice that North and East Africa are separated from the Arabian Peninsula where Islam began by the narrow Red Sea. Consequently, it is not surprising that soon after its founding Islam began to spread into nearby areas of Africa. As noted in the quote above, the vast Sahara Desert and the Red Sea and Indian Ocean were not great barriers to the spread of Islam. Arabs had lived, traveled and traded in desert conditions for centuries before the founding of Islam. Moreover, since the Arabian Peninsula is bordered on three sides by water, Arabs were experienced sea traders. Egypt was the first African country to come under the influence of Islam. At the time of the arrival of the first Muslim traders Egypt was predominantly Christian. Indeed, Christianity had become the main religion in Egypt hundreds of years earlier soon after the formation of Christianity. It took several hundreds of years before the majority of Egyptians, including its new Arabic speaking rulers, became Muslims. However, a small minority of Egyptians remained Christian. These Coptic Christians continue to live in Egypt. Egypt became a important gateway through which Islam spread to other parts of Africa. From Egypt Arab traders introduced Islam to the West into area called the Maghrib which includes the present day countries of Tunisia, Algeria and Morocco. Islam was not automatically accepted by the local Berber speaking populations. Indeed, Islam did not become the predominant religion across North Africa until the Twelfth century C.E. The spread of Islam in North Africa was accompanied by Arab rule. Arab traders who first facilitated the spread of Islam gradually gained political control of North Africa from the indigenous populations. Consequently, North Africa became Arabic as well as Islamic. Today, Arabic is the official language of Egypt, the Sudan, Libya, Tunisia, Algeria, and Morocco. The spread of Arab political control and the Arabic language in North Africa is unique. Nowhere else in Africa did Arab political control accompany the spread of Islam. Islam also spread southward out of Egypt along the Nile River valley into present day Sudan and Ethiopia. Christian populations in Nubia (north east Sudan) were able to resist the expansion of Islam for many hundreds of years. However, by the fifteenth century most of northern Sudan and Eritrea had converted to Islam. Arab traders had sailed down the Red Sea into the Indian Ocean and along the east coast of Africa for centuries before the formation of Islam. After Islam was established, in addition to material goods, Arab traders took with them their religion as they traded with Africans along the east coast. However, conversion to Islam was a slow process along the east coast of Africa. While Arab-Swahili Muslim communities formed along the coast as early as 780 C.E., it was not until the beginning of the 15th century that the majority of the coastal population in what is today Somalia, Kenya, and Tanzania were Muslim. After taking hold in North Africa and along the coast of East Africa, Islam gradually spread southwards from the north into the Sahel region of West Africa and somewhat latter from the East coast westwards into the interior of East Africa. Islam was first introduced into West Africa south of the Sahara across the salt and gold trade routes. By the twelfth century C.E., many Berber traders had been converted to Islam. Although these Muslim traders did not actively try to convert West Africans to Islam, they did practice their religion during the time that they spent traveling in West Africa. Moreover, as time passed Muslim traders were accompanied on their journeys by Muslim clerics and scholars. These men of religion interacted primarily with local rulers. As men of learning, they provided advice to local rulers on matters related to trade, security, and governing. Gradually, Muslim advisers became important to West African rulers. This was particularly the case, as you will remember, in the West African Empires of Ghana and Mali [See Module Seven A: History of Africa]. Remember the story of Mansa Musa the great king of Mali who made an impressive Hajj to Mecca? It often took many years for West African leaders to be fully convinced of the virtues of Islam and to convert. It was not until the leaders of a kingdom or state had converted that an effort was made, usually with the full support of the leader, to convert ordinary citizens. As you can imagine, the process of conversion of an entire nation or kingdom was a long process. It often took several generations before the majority of the people in a particular kingdom or society were practicing Muslim. This gradual process resulted in a situation where people would adopt some Islamic practices and beliefs while maintaining some of their indigenous beliefs and practices. Gradually, Islamic practice became more predominant, but often elements of indigenous belief and practice would continue. This process of gradual conversion and adaptation is testimony to the openness and flexibility of both African indigenous religious systems and Islam. By the time the kingdom of Mali was replaced by Songhai, Islam had become the primary religion of the peoples of the Sahel. Between the 17th and 19th Centuries, there was an expansion of centralized kingdoms in West Africa that were governed by Muslims and whose governance was greatly Influenced by Islam. Prior to the colonial era, most of the savanna region of West Africa from Senegal and Guinea through Mali, Bukina Faso, Niger and Northern Nigeria was under the control of Muslim rulers. Islamic expansion from the coast were Islam had a strong presence as early as the tenth century C.E into the interior of North East Africa was frustrated by the Christian kingdom of Ethiopia. By the 19th century, Islam had become the dominant religion to the north, west and east of the mountain kingdom, but Ethiopia was able to maintain its Christian faith. To the east of Ethiopia, Somalia and coastal Eritrea became Muslim. Further to the south along the coast of East Africa, Arab traders had established a system of city-states including Lamu, Malindi, Mombasa, Dar-es-Salaam, and Kilwa by the 18th century. In addition, Arab traders gained control of the Pemba and Zanzibar, two islands off the coast of Tanzania. Between the 17th and 19th centuries, a new vibrant culture developed as a result of the integration of Arabic and indigenous African peoples and cultures. The new culture and people are the Swahili who developed a new language KiSwahili which is a mixture of Arabic and several African languages. Today, KiSwahili is the most widely spoken language in East Africa. In spite of the political, economic and cultural success of the Arab-Swahili city states, Islam for many years did not spread into the interior of East Africa. However, a change in the economy of the east coast in the 19th century resulted in the spread of Islam into the interior of East Africa. The Arab-Swahili had traded with the interior of East Africa for many centuries. This trade however was carried out through the use of trading partners from the interior. These African partners brought goods from the interior-primarily gold and ivory-to the coast where they traded their items for goods -primarily cloth and glassware-that the Arab traders imported from Arabia and south Asia. Consequently, unlike the West African Sahara trade, Muslim traders had very little contact with the interior of East Africa. This situation changed in the late 18th and 19th century. Arab-Swahili business-persons began to develop coconut plantations along the coast, and sugar and spice plantations on the coastal islands. In order for these plantations to prosper, the owners needed a cheap supply of labor. To meet this labor need, the Arab-Swahili plantation owners began to import slaves from the interior of East Africa. The Arab-Swahili were not the first persons to develop a slave trade in East Africa. As early as the 17th century, the Portuguese, who then controlled the coastal region of Mozambique, had raided and traded for slaves in the interior of east-central Africa. Some of these slaves were sent to work in Brazil and others to work in South Africa. The Arab-Swahili were not able to depend on their established trading partners to provide slaves, since these partners had no tradition of raiding for slaves. In order to obtain slaves, the Arab-Swahili themselves went into the interior of East Africa in search of slaves. To assist them in this endeavor, some slave traders developed special relationships with established kingdoms in the interior. Through their contact with these new trading partners, Islam was gradually introduced into some regions of the interior of East Africa. This expansion, however, was interrupted soon after it began by the introduction of European colonialism in the late 19th century. While the East African slave trade, like the Atlantic slave trade, is abhorrent, it is important to remember that Islam was not the only religion to condone slavery and a slave trade. The Christian church in Europe and the Americas supported slavery and the Atlantic slave trade until the beginning of the 19th century. Islam was most recently introduced into Southern Africa. The demand for cheap labor was responsible for the introduction of Islam into this region. As you remember from Module Seven B: History of Africa, the southern tip of Africa was the first area of Africa to be colonized by Europeans. In 1652, Dutch colonial settlers arrived at what today is Cape Town. The Dutch settler-farmers needed cheap labor to work on their farms. In response to this demand, the Dutch began to import slaves from Dutch colonies in South East Asia (Malaysia and Indonesia). Most of these slaves were Muslim. Throughout the years of slavery and after emancipation in the early 19th century, the descendants of these slaves maintained their strong religious affiliation with Islam. Today, there are nearly one million Muslims living in the area around Cape Town. A second group of Muslims came to South Africa in the 19th Century. At this time, British settler-farmers had developed huge sugar plantations in the province of Natal. Slavery had been abolished, but these farmers were able to recruit inexpensive labor from India. Today, there are more than one million people of Indian heritage living in South Africa. Approximately half of the population belongs to the Islamic faith. Although a large majority of South Africans are Christians, Islam continues to be an important religion in contemporary South Africa. Over the past thousand years, Islam has grown to become one of the most influential forces in Africa. Nearly half of all Africans claim affiliation with Islam. Adherence to the core principles -the Five Pillars -of the faith impacts the way people the lives of people and the communities in which they live. It is impossible to summarize all the ways in which Islam influences Africa. However, in concluding this section on Islam, it is important recognize a few factors that we have not adequately addressed. The success of Islam in Africa is partially the result of its ability to respect and absorb other traditions. 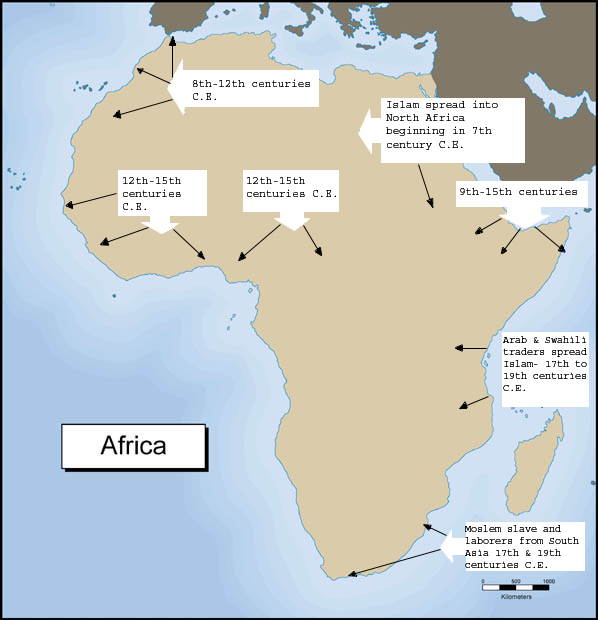 As indicated above, for the most part the spread of Islam in Africa was gradual. Muslims did not, for the most part, attempt to force Africans to convert to Islam. The conversion of individuals and whole communities took place over a period of time. Consequently, African converts often continued to practice some aspects of African traditional religions at the same time that the adopted the core principles and teachings of Islam. While Islam requires obedience to the five pillars, the religion is tolerant of other beliefs and practices as long as they don’t contradict these basic principles. Of course, the spread of Islam was also facilitated by the fact that many traditional African religions are also flexible and adaptable. The practice of Islam in Africa has been influenced by African religious belief and practice. Even in the most thoroughly Islamic societies in Africa you can observe the influence of African beliefs and practice. For example, the practice of Islam in Africa is more mystical than it is in other parts of the world. What does this mean? Mysticism has to do with the belief in a spiritual world, a world which humans can access and use to assist themselves in becoming better human beings. We have learnt that the spiritual world is very central to African religions. Scholars who study Islam in Africa, believe that the importance of the mystical in African practice Islam reflects an African contribution. Another African influence in the practice of Islam in Africa are the Islamic Brotherhoods or Islamic Orders that are very important, particularly in West Africa. Islamic Brotherhoods bring together believers who work together. 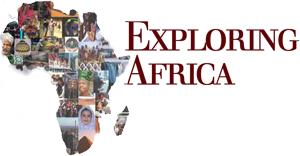 Scholars believe that the existence and importance of Islamic Brotherhoods reflect communal nature of African society. In addition to libraries and universities, Islam is dedicated to teaching the young. Education for the young focused on learning to read and understand the Quran. Consequently, Islamic schools are often called Quranic Schools. 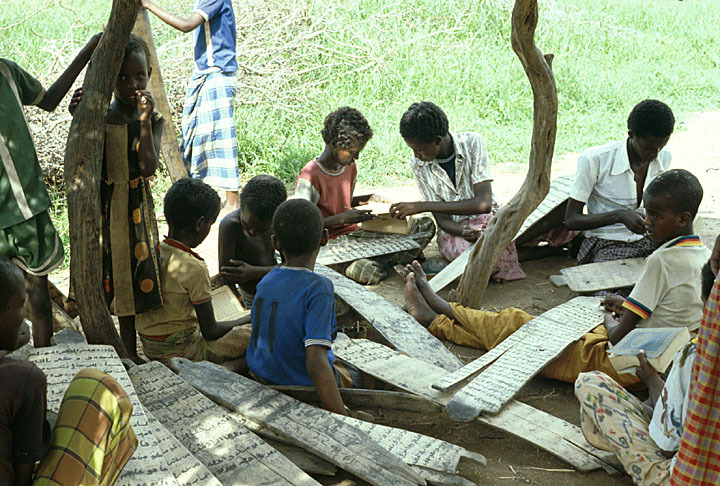 Quranic schools existed in North, West and along the coast of East Africa, long before Christian missionaries introduced Christian schools in Africa. Islam promotes human welfare. Like the Bible -the holy book of Judaism and Christianity -the Quran is full of directions on how people should live. Fairness and economic justice are central teachings in the Quran. Indeed, remember that one of the central pillars of Islam is the contribution of the zakat of social tax. The zakat is meant to assist those in the community who suffer misfortune. The practice of zakat has helped to alleviate the impact of poverty in many African communities. 1. 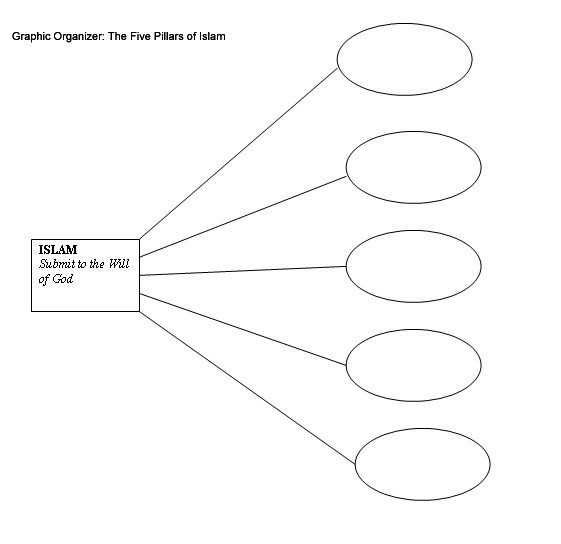 Graphic Organizer: Your teacher will provide you with a graphic organizer on the Five Pillars of Islam. 2. Writing Assignment: Read the following description of the Hajj to Mecca taken by Mansa Musa king of Mali in 1324 C.E. After reading this selection, write a short story in which you imagine yourself as a young member of the king’s court who accompanied him on this great pilgrimage. Describe what you saw and did on this trip that took nearly nine months! Mansa Musa was probably the greatest king of the Empire of Mali. He ruled Mali for twenty-five years (1312-1337). As far as we know, Mansa Musa was the first Muslim ruler in West Africa to decide follow the Islamic instruction to participate in a Hajj (pilgrimage) to the holy city of Mecca. To get to Mecca, in present day Saudi Arabia, Mansa Musa and his entourage had to travel more than 3000 miles across the Sahara desert (look at a map of Africa). According to the Arab historian al-Umari who witnessed the pilgrimage when it passed through Cairo, Egypt, Mansa Musa’s entourage included 100 camels each loaded with 300 pounds of gold, 500 servants each of whom carried a four pound gold staff, his senior wife with 500 attendants, and more than one thousand subjects. Mansa Musa gave away so much gold on his way through Egypt that the value of gold actually dropped! As a result of this Hajj, Mali became famous. People from Asia, North Africa and Europe learned for the first time of this great empire in West Africa. More importantly, while in Mecca and Cairo, Mansa Musa purchased many books and recruited many leading Muslim scholars to return with him to Mali. These scholars were responsible for the opening up of libraries in Mali and a university at Timbuktu. A 14th Century C.E. lithograph of Mansa Musa celebrating his power and his Hajj to Mecca.